Have you ever read The Art of War by Sun-Tzu? Well, in case you haven’t, I’ll give you a quick overview. The Art of War is a book of ancient Chinese military strategies that is credited to Sun-Tzu, a high ranking military general during the Spring and Autumn Period (roughly 770 BC – 476 BC). The book is divided into thirteen chapters, each relating to a different aspect of warfare tactics. The notion of the book is that one can avoid conflict, prevent defeat and triumph over the enemy if he operates according to the strategies laid out in each chapter. For acting on emotions and irrationality in a time of war inevitably brings defeat to the leader himself, his men and, ultimately, his country. 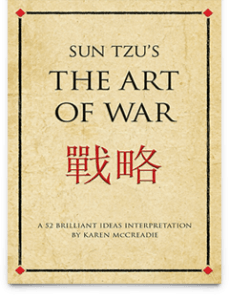 Keep in mind that The Art of War is not intended to provide soldiers with a step-by-step guide that instructs them on how to act and react in specific situations. Rather, it provides the individual with the knowledge that’s necessary to make strategic decisions based on the information at hand. It’s a way of thinking that enables one to plan and execute a tactical approach for overcoming any given situation. Not in a hundred battles. If you’ve ever ran your own organic SEO campaign, you know how difficult it is to rank in Google above your competitors. If your company sells lawn mowers and lawn care products, you can’t target “Lawn Mowers” and “Miracle-Gro” and expect to show up in the top ten search results for Google. Especially if you’re a new company or have a new website; that’s an unrealistic goal. You need to conduct research and find out where your competitors are ranking and what they did to get there. Set achievable goals, choose realistic keywords, and devise a strategy for executing your campaign effectively with the resources that you have. If you’re running a PPC (pay-per-click) campaign, you will need to conduct further research to determine the best way to allocate your budget. In terms of organic SEO, this may refer to how much time you’re willing to spend on research or how much money you’re willing to pay an Internet marketing company in order to achieve your desired results. Making use of the resources at hand, utilizing your own strengths, analyzing your competitor’s situation and taking environmental factors into account are all ways of thinking that will enable you to develop the most logical SEO strategy for producing the best possible outcome. Do your research. Find out what people are actually typing into their search queries in order to discover which keywords have the most potential for helping you rank well. If you target a keyword because it has little to no competition, what good will that do for your ranking if no one is searching for it? Over time, if you find out that you aren’t ranking for any of the keywords that you’ve targeted, don’t get frustrated and start over. Investigate! After all, you chose those keywords for a reason. Why aren’t you ranking for any of the terms you’re going after? Are you implementing them properly within your body copy? Are you building internal links and exploiting external factors, such as social media? It’s less than likely that you’ll plan and implement your organic SEO strategy and rank on the first page of results for all of your key terms, so be patient and adapt. Start small and work your way up until you have enough page rank and credibility to go after the big fish. If your company makes custom hats, golf accessories, bowling equipment and sports apparel, and your competitors have the search query “Custom Hats” on lockdown, allocate your resources elsewhere. If those companies only offer custom hat designs, there is an opportunity for you to target the other services your company offers and dominate the search results for those terms. “To attack alliances” could refer to your competitors’ alliances, but in this case I like to think of the alliances in respect to the supporting keywords. For example, if the original “head” terms you wanted to target are too competitive, try going after more specific keywords, known as long tail keywords. Sure, they’re less common than the broad terms; but it’s better to rank for a lot of long tail terms that are relevant to your site than no terms at all. As you begin to build your site’s credibility, other sites will start linking to you and more people will see your page in their search results. Optimizing your on-page SEO, creating quality content for the user, and increasing the number of links to your site are just a few of the things that will help your website become a trusted and authoritative site. Once this begins to happen, you can start branching out and going after the larger terms – i.e. “To attack Armies”. This concept ties into the previous section with respect to allocating your keywords appropriately. Essentially, it doesn’t matter if you’re targeting 30 keywords or 300 keywords; you never want to put all of your eggs in one basket. Period. Developing a successful keyword strategy involves more than merely choosing terms that have a lot of opportunity. You need to implement them within pages that have high quality content that is relevant to the keyword and the user. With a combination of on-page and off-page SEO, a company can build a strong presence in the SERPs and outrank their competitors. From the lie of the land. From the dynamic of the enemy. This is perhaps the most important philosophy; for if it is overlooked, your other strategies will prove to be ineffective over time. In an ever-changing market you must either change with the conditions or be left behind. Just because you’ve commandeered the #1 spot in Google, that doesn’t mean that someone else isn’t already gunning for it as we speak. You must be engaged in your surroundings and flexible to the changes that take place with both Google’s algorithm and your competitors’ SEO strategies.